Too often, designers, illustrators, and small agencies have to interact with prospects who want a discount on their project based on the promise of future work. This is a dirty form of business, and creatives need to avoid these pondscum clients like the plague. While I find this mildly insulting, I find it even more incredulous when someone not only demands a discount, but hinges the promise of future work on a forthcoming judgment of the work I have not even done yet. This is like demanding to buy a cake at half price because you might come back to buy another one, if they’ve met your arbitrary expectations on this one. I’m not sure where people find that reservoir of arrogance, but they need to plug the leak and get a grip on reality. No future project — no matter how lucrative, portfolio-worthy, or paradigm-shifting — is worth any discount on the current piece. 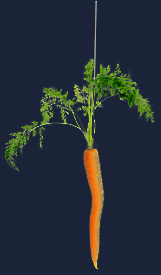 Unless there is a signed contract outlining every detail of both current and future projects, taking a financial hit because the client is promising a fatter, juicier carrot just over the horizon is as criminal as spec work. It’s important for designers and illustrators to bill themselves fairly. Compromising this not only enables a client to get away with an unfair business deal (essentially cheating you), but permanently establishes the fact that your ethical fiber can be bent, which will haunt you down the road. (“But you charged me a fraction of this last time. Why do I have to pay more now?”) You also don’t want to have to pass on legitimate and fair opportunities because your production schedule is flooded with low-paying gigs. Unfortunately, the world is teeming with knuckle-dragging cheap asses. The same ones who demand discounts are the same ones who seek out students for free work, amateur designers for a “partnership with longterm potential,” or illustrators for an opportunity “to get their name out there.” These guys will spin whatever tale is necessary to lowball a hard-working artist. I know — I field their calls several times a month for my own business. Avoid them from the outset or they will plague you for years. Having been on both sides of the fence now, I’m starting to understand why some clients do this, but I definitely agree that its generally unadvisable to give a discount on a tester project with the prospect of future work. Typically people who insist this are inexperienced, pressed for time or broke. But I’ve had this situation with huge companies who mean it for real. When somebody wants to do a tester project with you it means that your portfolio and /or client roster is hard to judge. They can’t tell if you are as good or experienced as you appear. They don’t know how to read you, maybe you clock tons of hours or fight over little things, produce worse work than you display etc, so they want to test you out – cheaply – to find out if the long-term relationship is worth it. Typically more experienced or larger clients will have a more refined interview process to compensate for this, but people who don’t have the time or $$ to go out and check references, etc will try the tester project approach. An experienced client will back down and feel sheepish about the discount offer when you call them out on it. A bad client will not and you shouldn’t give them any more thought. But if you know the client is legit and really does have lots of work, sometimes its really worth it. While I don’t generally discount my services for web deisgn, marketing consulting or print design, I do however always try to build in a 10% new client discount when I start working with a new client. I have found that the client really appreciates this, feels like they are getting more for their money, and if they like the work are more likely to continue doing business with me. I haven’t found it to have any negative effects on my relationships or earning potential as a freelancer. 1. You’ll be put in the “cheap pile”. As soon as their budget starts too look more juicy, they’ll drop you for the upscale agency with the glossier price list. 2. Once you’ve established a certain price relationship it’s difficult to change it. (As you rightly said, “But you charged me a fraction last time…”). 3. Not all companies make it. You might develop a discounted logo only to have the company dissemble within 6 months.